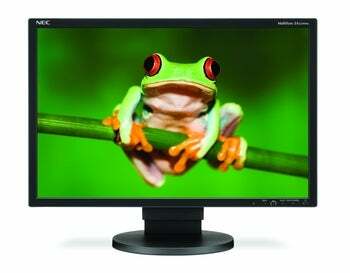 Those in the market for a new, green display should do themselves a favor and check out NEC’s newest LCD based LED display, the MultiSync EA222WMe. The EA222WMe uses LED technology for backlighting (much like Apple's current 24-inch display); not only does this provide the same amount of brightness (250 cd/m²) as more traditional monitors, but it also significantly reduces enrgy consumption. Compared to its other NEC brethren, this display consumes up to 52% less power, radiates up to 61% less heat, is about 25% lighter, and uses up to 15% less packaging--which, by the way, uses recycled plastics, a bio-plastic bag and paper filler. Moreover, it is compliant with ENERGY STAR 5.0, TCO 5.0 and EPEAT Gold, making it the most energy-efficient desktop monitor offered by NEC to date. With the EA222WMe, you'll be able to track your carbon savings with the display’s resettable carbon footprint meter, a unique tool that calculates the reduction of greenhouse gas emissions. In addition, you'd get another one of NEC’s newest features--the cost meter--which will tell you your electricity cost savings via an on-screen display. What else should you expect to receive in return, aside from the satisfaction of being eco-aware? In addition to its 22-inches of 16:10 widescreen display with W-LED backlight, 1680 x 1050 native resolution, 30,000:1 dynamic contrast ratio, and 250 cd/m² of brightness, the EA222WMe will also come with a 4-way ergonomic stand, connectivity by VGA, DVI, USB and DisplayPort, and integrated, down-firing multimedia speakers to boot. So for those feeling to do a little giving and receiving in the near future, NEC has a solution with the EA222WMe, which will be available this December for $340. If you're looking for more advice on green computing, see Chris Brandrick's earlier post on the topic.